SmartDraw automates the creation of charts and diagrams so that anyone can do it. Just click a few buttons. In fact, you can build diagrams using only the keyboard. Insert shapes with simple commands. SmartDraw does the rest, allowing you to focus on your content, not your drawing. SmartDraw includes more than 70 different kinds of charts, diagrams and other visuals. No matter which type you need to create, chances are there's a quick-start template to help you get it finished in no time. There are also hundreds of examples. Just open one up, edit it, and make it your own. SmartDraw automation only begins at making diagrams easy to build. It also formats them for you, so that they are always ready to publish and share. SmartDraw automatically applies professional design themes, yet allows you to customize your drawings, if you wish. Adding photos and images is easy, too. SmartDraw is designed with Microsoft Office® integration. What this means is that with just one click, you can insert your diagram or visual directly into Word®, Excel®, PowerPoint® or Outlook®. Save your drawing as a PDF with a click. SmartDraw also works with Google DocsTM and other programs. 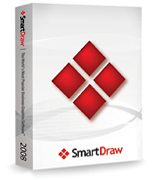 Your SmartDraw account is easy to access. All you need is a web browser on any computer or mobile device. There's even a free viewer app for your iPhone or iPad. Use your SmartDraw account to share your files with anyone, even non-SmartDraw users, or publish them on your favorite social media page. SmartDraw automatically backs up your diagrams, presentations and other visuals you create to your private, secure SmartDraw account. This allows you to access and view them on a web browser or mobile device, no matter where you are. You may also back up your older SmartDraw (.sdr) files in bulk.